Humana and "la Caixa" today are signing an agreement accession to, through the financial institution incorporates program, joining the Foundation encourages people at risk of exclusion. Humana has a workforce of 399 workers; 65% are women and 35% men, mean age of 36 years. A total of eleven people who were at risk of social exclusion have been contracted under agreements with different entities: six of them correspond to the delegation of Catalonia; five to Madrid; four to Andalusia and one to the north. Under the agreement with the Program incorporates the "la Caixa" Welfare Projects, Humana will receive an advisory service and support in the employment of vulnerable people. The Foundation will deliver the program incorporates the description of those for the jobs offered as staffing needs professional profiles; this information come to entities that are part of the program and the "la Caixa" Welfare Projects. The program incorporates oversees the labor market, offering advice, support in adapting to the workplace and follow-up after hiring. 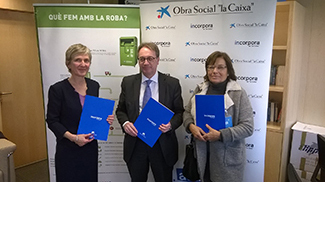 The agreement was signed by Elisabeth Molnar, general manager of the CEO of Humana Fundación Pueblo para Pueblo; Marc Simon, corporate director of the Social Department of Banking Fundación "la Caixa", and Gloria Canals, general manager of Projecte Aura Barcelona representing incorporates entities. Marc Simon stressed that, with this agreement, two objectives are met: "The entities that collaborate with the program incorporates understand that corporate social responsibility goes beyond an obligation and feels impelled to engage in the environment to provide more opportunities for those who have more difficulties. To all this is added, in this case, one's attitude and activity of Humana, whose spirit is to help both here and in many other places. This gives a double meaning to collaboration. " Simon has been worth the work done by Humana in relation to the protection of the environment: "In recent years has increased public awareness for the reuse and recycling, we are becoming more aware of the importance of making clothes." Gloria Canals, Aura Foundation, said that "the offer and availability of Humana are suitable for our users" and stressed that "Human activity not just in their stores, but behind many social projects". "When you know the organization from the inside of the great work being done you will give," he added, "for us, mutual cooperation is very good." 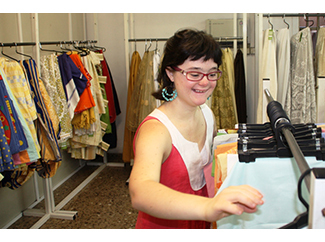 Note that recently joined the staff of two girls shopping in Catalonia, under an agreement with Aura Foundation.